The Bernedoodle is a cross between a Poodle and Bernese Mountain Dog. Other popular names for this mix are the ‘Bernese Mountain Poodle’ and the ‘Bernese Poodle’. It is impossible to guarantee the exact appearance of any mixed breeds. But, we can get a general idea of what to expect by looking at the parent breeds. Scroll on to find out what kind of information we cover in this guide to the Bernedoodle. Here’s some of our readers’ most popular and frequently asked questions about the Bernedoodle. What is a miniature Bernedoodle? How much do Bernedoodles cost? Here’s a summary of the most important information you’ll need to know if you’re considering buying a Bernedoodle. Do Bernedoodles Make Good family Pets? The Bernedoodle is the offspring of the purebred Poodle and the purebred Bernese Mountain Dog. Unlike its purebred parents, the Bernedoodle is a new generation crossbreed. The outcome of crossbreeding is not as predictable as mating two dogs of the same breed. 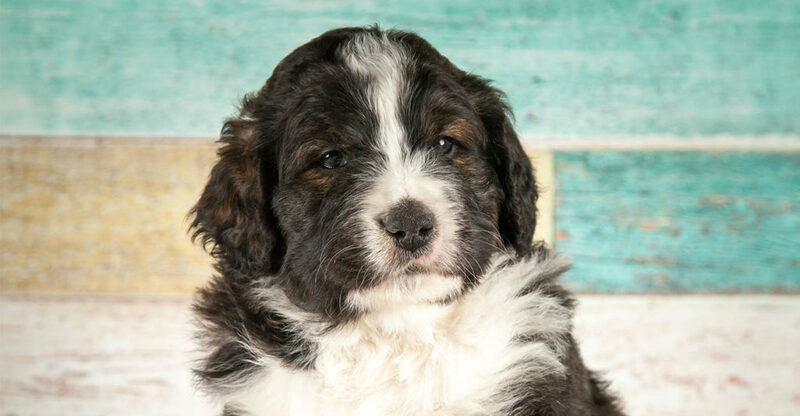 As a result, your cute little Bernese Poodle mix could grow up to be a lot like his Poodle parent, or a lot more like his Mountain Dog ancestors! This unpredictability of crossbreeding is one of the several reasons that people disagree about whether cross breeding is a good thing or not. We’ll look at that debate in a moment. Read on for a brief overview of the controversies of crossbreeding and see why there are valid points to both sides of the debate. One of the reasons that purebred dogs are so popular is because they have been bred for generations to ensure that things like size, temperament, and physical characteristics remain consistent. When crossbreeding a dog between two purebred parents, those above traits, along with many others, may vary from one puppy to another, especially if the parent breeds are very different. However, that doesn’t mean purebred dogs are perfect. As many of us in the dog-loving community are aware, purebred dogs have become increasingly plagued by certain health issues. Most of these are caused by generations of over-breeding in progressively smaller gene pools. Those who support crossbreeding claim the practice could be a solution to such health issues. Others disagree. You can follow this link to read more about the purebred vs mutts debate. Let’s talk a bit more about the Bernese Poodle mix, since this is what brought you here in the first place! We’ll start with where the Bernedoodle’s ancestors come from! Because crossbreeding is a newer practice, the Bernedoodle is a fresh addition to the dog world. Luckily, we are able to learn more about Bernedoodles and what to expect by taking a look at the histories of its purebred parents. Today, the Poodle is the national dog of France. But did you know it was originally bred in Germany nearly 400 years ago? Back then, the Poodle was best known for its skills in duck hunting! In fact, that’s where the Poodle’s famous haircut came from. Used mostly as show dogs today, the Poodle’s flamboyant coat style originally had a very practical purpose. The poms on a Poodle’s head, tail, chest, and legs were meant to help them swim well. In addition, they would also help protect the more sensitive parts of the Poodle’s body while hunting in freezing waters. It wasn’t long before the Poodle became known for more than just good hunting skills. Soon, they were popular in circuses. But it wasn’t just beauty that earned this pooch a spot in the limelight! Namely, the Poodle is incredibly intelligent and quick to pick up tricks, so was the perfect addition to theatrical acts. It’s no surprise that the Poodle eventually became popular with noblemen thanks to its extravagant coat and graceful gait. The Poodle certainly has lived a rags-to-riches story. But what about the Bernese Mountain Dog? The Bernese Mountain Dog comes from Switzerland, where it was once common to find them roaming the Swiss Alps. Formerly known by locals as the Dürrbachhund, after the small town of Dürrbach from which they originated, the Bernese Mountain Dog was initially used as a working dog. For instance, they were used to pull heavy loads and were widely used to help with farming tasks before industrial machinery became commonplace. Today, both the Poodle and the Bernese Mountain Dog are incredibly popular family pets, renowned for their intelligence, friendly nature, and work ethic. All in all, with two histories as rich as the Poodle’s and the Bernese Mountain Dog’s, it’s easy to see why a mixed offspring would be so appealing. 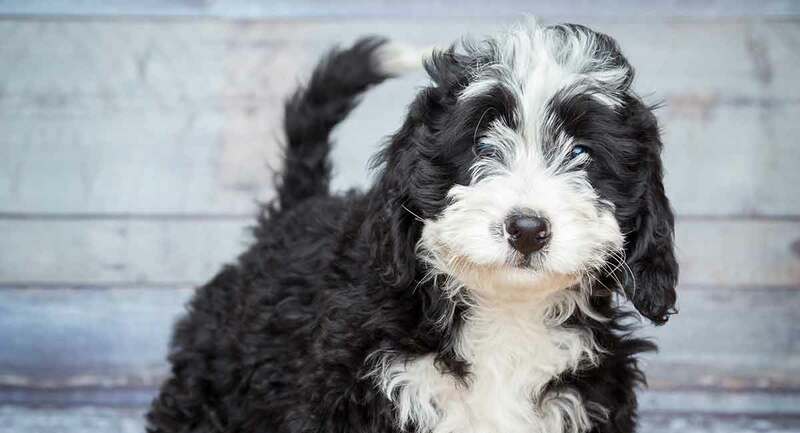 Read on to learn more about the possible traits your Bernedoodle could inherit! Brooklyn Nets star D’Angelo Russell is a big fan of this cuddly mixed breed. He famously adopted two adorable Bernedoodle pups named Molly and Max! So, one of the first things you’ll want to know before jumping on the Bernedoodle bandwagon is just how big these fluffballs grow! Let’s take a look. It’s always going to be difficult to know exactly what a crossbreed puppy will look like. For instance, they could inherit a wide range of physical traits from either one of their purebred parents. In this case, the Poodle and the Bernese Mountain Dog look as different as can be. So, things like height, weight, color, and texture are going to vary depending on what parent the Bernedoodle takes after most. So, to help identify some of the possible traits your Bernedoodle could inherit, we’ll look at the common physical traits of the Poodle and the Bernese Mountain Dog. The Standard Poodle has a lean, muscular build and a curly coat that comes in three standard colors: apricot, black, and brown. Also, the Poodle stands over 15 inches tall and weighs approximately 40-70 pounds. The Bernese Mountain Dog is known for its massive size and stunning, tri-colored coat that is primarily black, tan, and white. Also, this large breed stands at a towering 27 inches tall and weighs in at 70-115 pounds! Remember, your Bernedoodle could inherit any of the above traits. A Standard Poodle crossed with a Bernese Mountain Dog will produce the largest Bernedoodle. This means you could have a dog that reaches up to 27 inches in height and weighs a hefty 70lb to 80lbs. Possibly even more! A Miniature Poodle crossed with a Bernese Mountain Dog will result in a Mini Bernedoodle. This is likely to be a much smaller dog but there is plenty of room for surprises with one parent being so large. A Toy Poodle crossed with a Bernese Mountain Dog will give you the Tiny Bernedoodle. In light of this, you may be wondering if this random element can affect the Bernedoodle’s level of shedding. Let’s take a look. 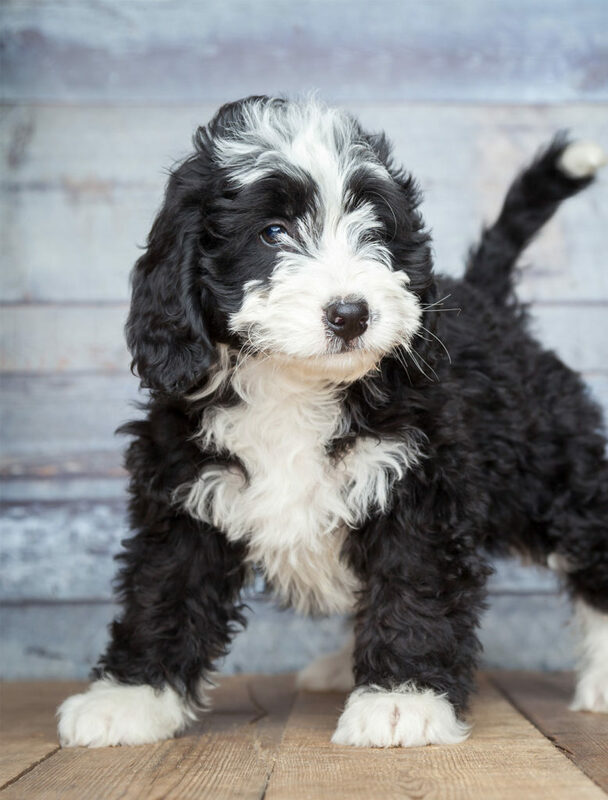 When it comes to a crossbreed like the Bernedoodle, we are dealing with a dog that has one parent who is hypoallergenic and the other who is not. While the Poodle does not shed, the Bernese Mountain Dog has a longer coat that sheds profusely and requires consistent brushing and grooming. Even so, it’s more likely that your Bernedoodle will shed, even if it’s just slightly. As previously mentioned, crossbreeding comes with its share of controversy. One of the issues is the inability to predict with certainty the type of temperament your crossbreed could inherit from its purebred parents. In this case, both the Poodle and the Bernese Mountain Dog share a few of the same behavioral traits that will more than likely be passed on to their Bernedoodle puppy. For example, both the Poodle and the Bernese Mountain Dog are intelligent breeds who are very alert and friendly. Take a look at our section on whether Bernedoodles make good family pets for more information on how well they do with children and other pets. As we mentioned above, your Bernedoodle’s personality and needs will depend a lot on which parent dog it takes after most. The Poodle is slightly more active than the Bernese Mountain Dog. However, both breeds need adequate exercise, attention, and play. The same goes for the Bernese Poodle puppy! Therefore, we recommend daily walks and time to play and romp in the yard. In addition, your Bernedoodle may also enjoy trips to the local dog park or hiking trails! One thing to note is the Bernese Mountain Dog does not tolerate heat well, and this could easily translate to their offspring. So, keep this in mind when letting your Bernedoodle outside to play for extended periods of time. Of course, always make sure there is adequate shade and plenty of access to fresh water with any dog who enjoys being outside often. 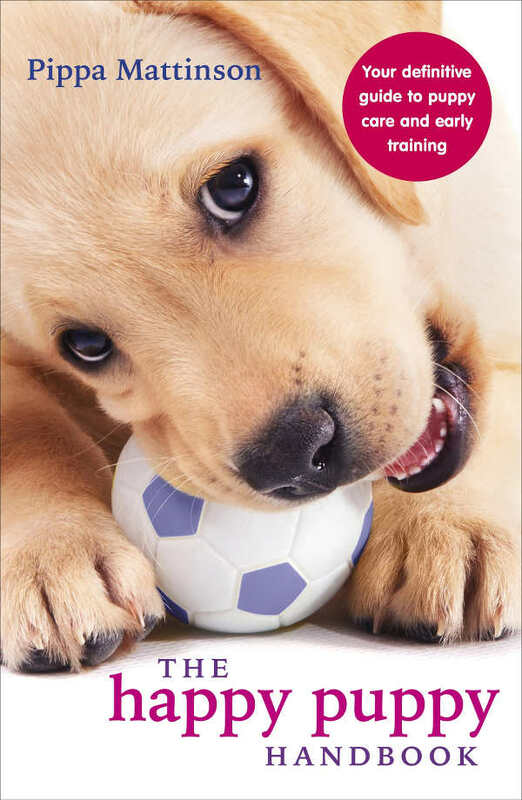 As with all breeds, we recommend early socialization and training at an early age to ensure a well-adapted dog. We recommend brushing your Bernedoodle with a wire brush to collect dead hair at least once a week. Other than that, both the Poodle and the Bernese Mountain Dog only require occasional bathing, so you can count on the same for your Bernedoodle. They will also need weekly ear checks and cleaning to avoid infection caused by waxy build-up and moisture. In addition, we recommend regularly trimming your Bernedoodle’s nails to avoid splitting and cracking. This can result in infection and pain. Unfortunately, Bernedoodles can be prone to epilepsy, hypoglycemia, Addison’s Disease, progressive retinal atrophy, thyroid issues, hip dysplasia, and bloat. Mostly, they are often predisposed to hip dysplasia and elbow dysplasia, bloat, and mast cell tumor. As previously mentioned, the Bernese Mountain Dog does not do well in hotter environments. Therefore, it’s important to be aware of outside temperatures when your dog is outside. Also, early health screening for your puppy is an option we like to recommend. This can help to prevent or prepare for certain health problems you may end up encountering in the future. The average lifespan for a Poodle is 12 years. The Bernese Mountain Dog has a shorter average lifespan of 8.4 years. Therefore, provided both parent dogs are healthy, you can expect your Bernedoodle to live an average of about 10 years. However, it is still unclear if crossbreeding is a true solution to the generational health problems that have been problematic for purebred dogs. For this reason, it’s best to be aware of all the health issues the purebred parents are predisposed to. Both the Poodle and the Bernese Mountain Dog are intelligent breeds who enjoy being around their family members and do well with children, so we can expect the Bernedoodle to behave similarly. However, like any large dog, they need to be well trained to ensure that they are safe and good company both at home and while visiting friends and family. The Poodle, for example, makes a wonderful student who is eager to please and enjoys learning new tricks. They are also incredibly active and will need a steady amount of exercise and play. Despite their size, Bernese Mountain Dogs are more docile than Poodles. For instance, they enjoy lounging around the house or resting in a nice, cozy spot. However, that’s not to say the Bernese Mountain Dog won’t enjoy a nice run in the yard. They also make great jogging or hiking partners. Remember, this dog was once a working breed, and is used to walking long distances. Odds are the Bernedoodle will also be a large, active crossbreed who will do best in homes with yards rather than in smaller apartments. But if you don’t mind a bit of shedding and if you have the ability to train and exercise your Bernedoodle on a consistent basis, then this just might be the perfect crossbreed for you! 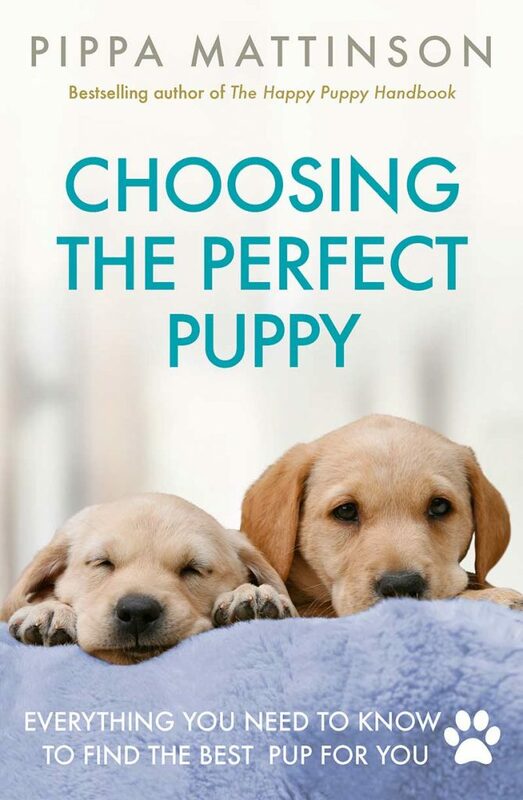 Nevertheless, when on the hunt for a puppy, we recommend looking at all your options. Rescuing a dog in need of a home is usually a reliable and rewarding experience. If you have your sights set on adopting your Bernedoodle from a local shelter or a Bernedoodle rescue, remember that there is a chance you may not find the crossbreed right away. So, don’t set yourself up for disappointment! First, try calling your local shelters and asking to be notified when a Bernedoodle arrives. Also, be sure to ask about health screening options, temperament issues, and any backstory the shelter may have on your Bernedoodle, such as where they came from and how they wound up there. To get started, take a look at our list of rescue agencies to see if there’s one in your area. However, if you prefer the fun and excitement of raising a puppy yourself, make sure you do your research and find a reputable breeder. Finding a puppy from a reliable source is one of the most important things you can do for yourself and your potential dog. First of all, remember that not all breeders are responsible. Be sure to ask plenty of questions regarding temperamental and health issues with previous litters or the parents of your Bernedoodle. Secondly, reputable breeders should be able to deliver certificates that prove their dogs have been screened for health and temperamental issues, so don’t be shy about asking for those. If you would like more information and help on finding Bernedoodle puppies, you can visit your local AKC club. If you plan on going to a breeder to purchase your puppy, expect to drop anywhere from $500 to over $1000. This price will vary depending on the breeder and the purebred parents. For example, if the breeder is well known and often produces high-quality show dogs, prepare to pay more. If you are lucky, you may be able to find a Bernedoodle available for adoption from a shelter or rescue organization. Keep in mind that although shelters are a fraction of the price of breeders, there will be adoption fees that can run anywhere from $50 to $100. On the flip side, shelters will often cover the initial veterinary fees, ensuring your Bernedoodle is healthy, happy, and ready to come home! We have also put together a useful list of products and accessories that you’ll need before welcoming a Bernedoodle into your home. Still unsure if this is the breed for you? Here’s a quick summary of the pros and cons of owning a this breed. Comparing the Bernedoodle with other breeds can be helpful if you are torn between this mixed breed and another. Take a look at our guides to other Poodle mixes and Bernese Mountain Dog mixes. Or, read on for similar breeds. Good luck! We hope your Bernedoodle brings you lots of joy for years to come. If you already own a Bernedoodle, let us know in the comments how you found one and what your experience has been. Adams, VJ, et al. 2010. “Methods and mortality results of a health survey of purebred dogs in the UK.” Journal of Small Animal Practice. Klopfenstein, M, et al. 2016. “Life expectancy and causes of death in Bernese mountain dogs in Switzerland.” BMC Veterinary Research. Mattinson, P. 2018. 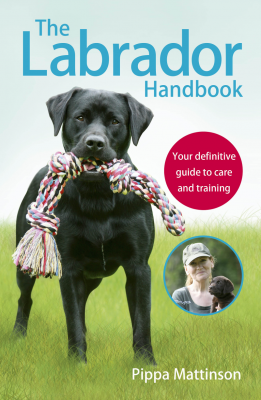 “Purebred Vs Mutt-Common Objections to Mixed Breed Dogs.” The Labrador Site. Abadie, J, et al. 2009. “Epidemoilogy, Pathology, and Genetics of Histiocytic Sarcoma in the Bernese Mountain Dog Breed.” Journal of Heredity, Volume 100. Turcsan, B, et al. 2017. “Owner Perceived Differences Between Mixed-Breed and Purebred Dogs.” PLOS One. Howell, TJ, et al. 2015. 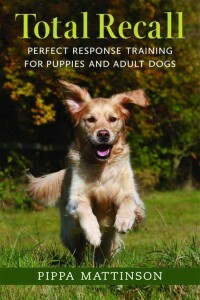 “Puppy Parties and Beyond: the role of early age socialization practices on adult dog behavior.” Dove Medical Press. Santoro, D and Marsella, R. 2002. “Genetic aspects of labrador retriever myopathy.” Research in Veterinary Science. Sutter, NB and Ostrander, EA. 2004. “Dog Star Rising: The Canine Genetic System.” Nature Reviews Genetics, Volume 5. Irion, DN et al. 2003. “Analysis of Genetic Variation in 28 Dog Breed Populations With 100 Microsatellite Markers.” Journal of Heredity.